Besides the built-in ringtones, iPhone users are also able to use the ringtones purchased from iTunes Store, or the customized ones that are added from computer. These added ringtones will take up the storage space in your iPhone, and you will have to delete the ringtones in your iPhone sooner or later. Therefore, the post aims to show you how to delete ringtones from iPhone 4/4s/5/5s/6/6s/SE. Whether you use the old iPhone or new iPhone SE/6s, you can take advantage of the guidance below to delete ringtones from your devices. The built-in ringtones on your iPhone cannot be deleted, but the third-party ringtones can be deleted with iTunes in seconds. 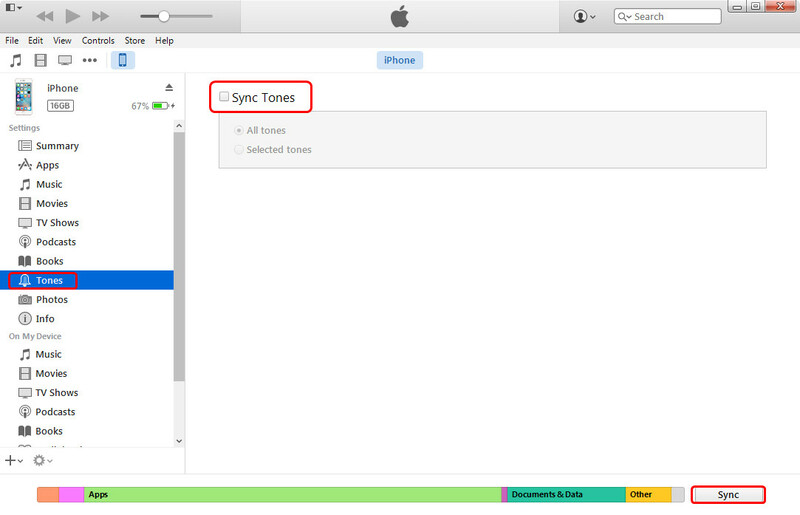 The users can delete the ringtones in iTunes library, and then sync the iPhone with iTunes. 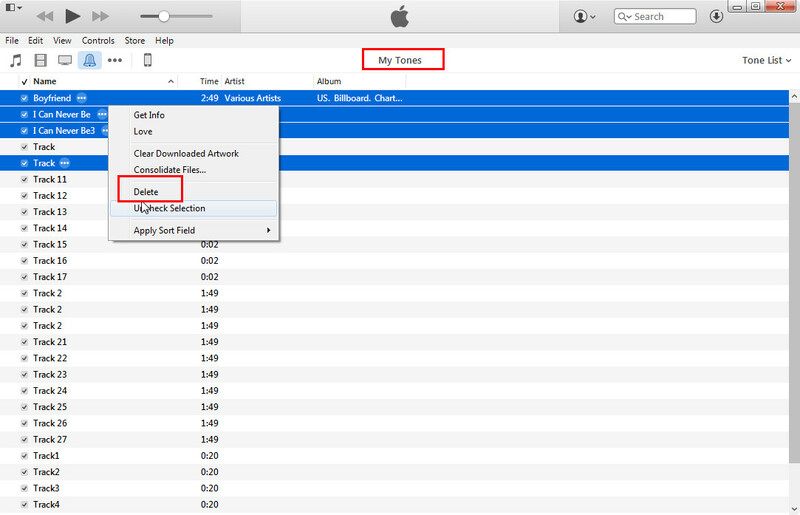 The users need to go to “Tones” library in iTunes, and delete the tones they don’t need. After that, plug iPhone into computer via the USB cable, and sync iPhone with iTunes. Then users will get the unwanted ringtones deleted in their iPhone. 1. Open iTunes on your computer, on the top left corner of the iTunes window, click on Tones category. It will display all the ringtones you had added to your iTunes library. 2. 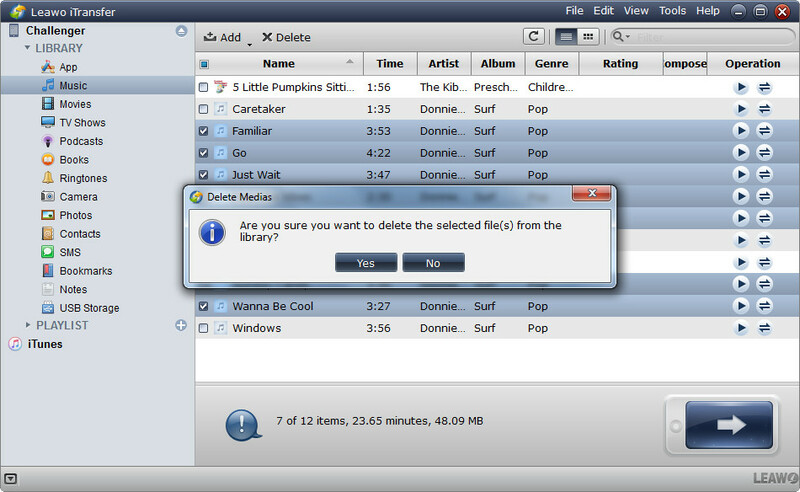 Select a ringtone or hold on “Ctrl” to select the ringtones you want to delete from your iPhone. Right-click on the selected ringtone to display a menu of commands. Click “Delete”. 3. Click on iPhone icon and choose “Tones” under the “Devices”, then select the “Sync” option to sync iTunes to iPhone that will remove the deleted ringtones from your iPhone. 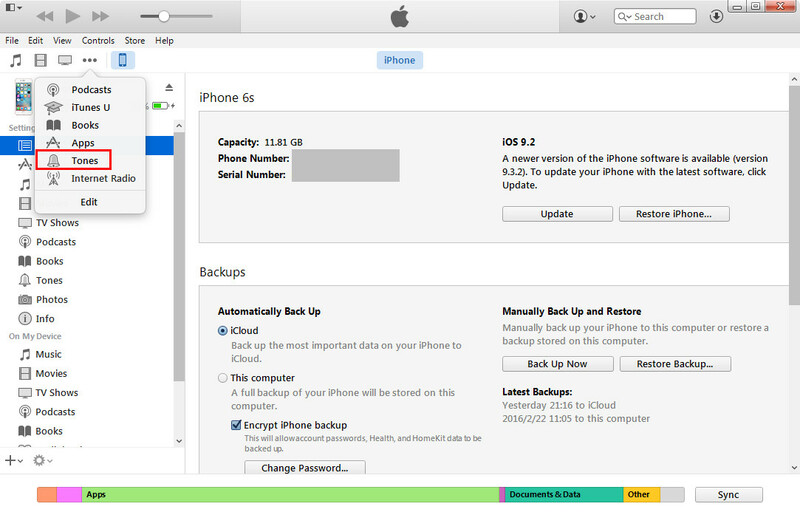 However, when the users sync their iPhone with iTunes, they will find that the non-purchased items are deleted as well. Then iPhone users will have to manually import the files into their iPhone again. If the users want to delete ringtones from iPhone without losing other non-purchased items, the iPhone transfer software will provide you much help. Leawo iTransfer is one of the best iPhone transfer programs on the Internet, and this software helps users to delete ringtones from iPhone effortlessly. This software enables users to transfer files among iOS devices, iTunes and PCs, and it enables users to transfer apps, music, movies, TV shows, ringtones, ebooks, photos and Camera Roll. 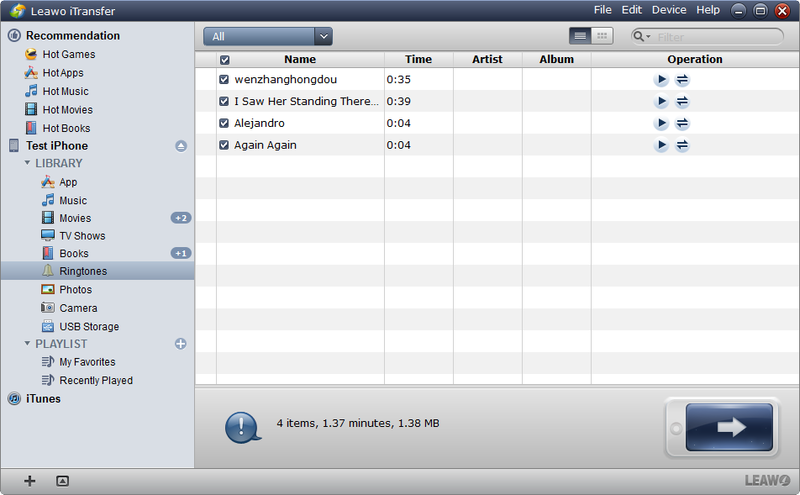 With Leawo iTransfer, users are able to manage the files in their iOS devices with ease. The following guidance will show you how to delete ringtones from iPhone 4/4s/5/5s/6/6s/SE with Leawo iTransfer, and you are allowed to free download the software to have a try. Note that the trial version has limited transfer times. 1. Start Leawo iTransfer and connect iPhone to computer with the USB cable. The software will automatically detect the libraries of the iPhone, and then list the libraries in the left sidebar. 2. Choose “Ringtones” and then the ringtones will be shown in the right part. Select the ringtones you want to delete and then right-click the chosen ringtones, and click “Delete” in the drop-down menu. The software will start the deleting process immediately. The progress bar in the dialog will show you the percentage of the deletion. When the deleting process is done, you will delete the ringtones from your iPhone. Of course, before deleting the ringtones, the iPhone users will want to backup iPhone ringtones to computer at first. Leawo iTransfer can provide you help on this issue. The following guidance will show you how to do it. 1. Start Leawo iTransfer and connect iPhone. After the software detected the libraries of iPhone, choose “Ringtones” library in the left sidebar. 2. The contents will be shown in the right part of the window. Click the transfer button to transfer all the ringtones to computer. Or hold “Ctrl” key and click to choose certain ringtones, then right-click the chosen ringtones to “Transfer to > My Computer”. 3. 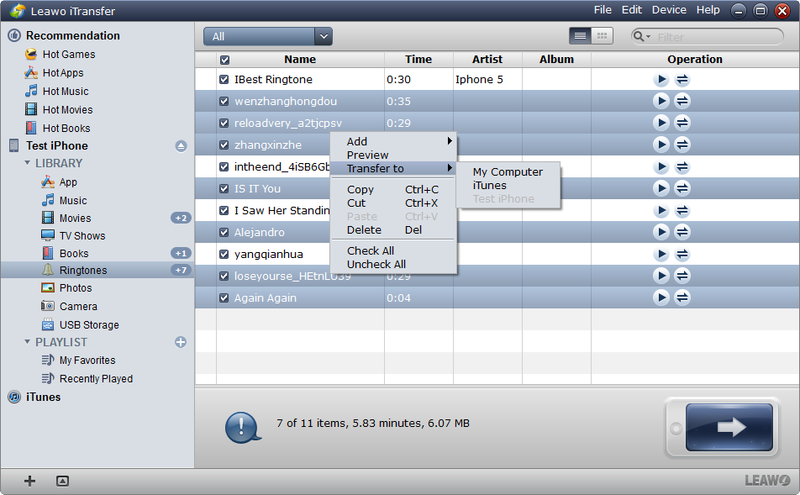 After choosing ringtones, you will see the pop-up dialog of transfer settings. Check “Save to Folder” and click “Change” to choose a folder on your computer to save the ringtones. 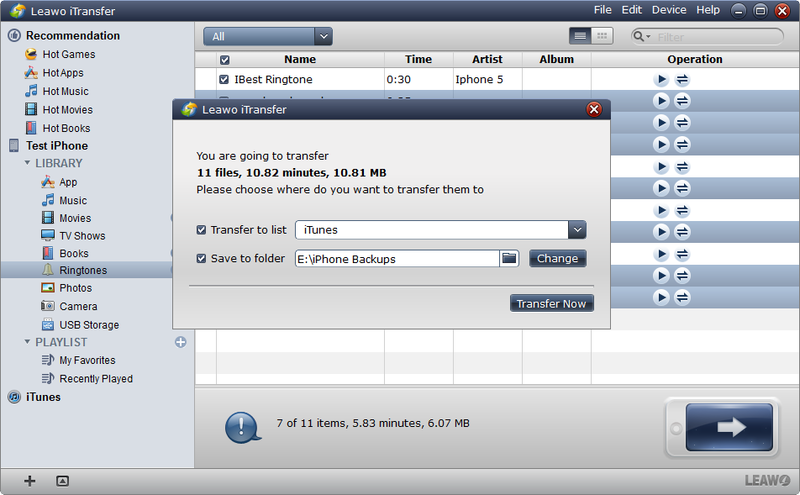 Then click “Transfer Now” at the right bottom to start backing up iPhone ringtones to computer. When the ringtone transfer is finished, you will get the ringtones in the target folder. Besides deleting files from iOS devices, Leawo iTransfer also helps users to transfer files among iOS devices as well, for example, you can copy ebooks from iPad to iPhone with this software. Leawo iTransfer is a very helpful program for our daily uses. If you are interested, just free download it and have a try.